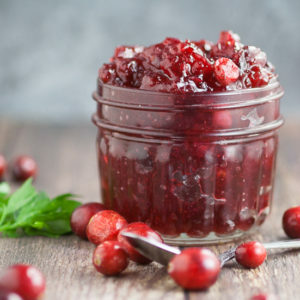 A simple, sweet and tangy version of a classic, this 4 ingredient Easy Homemade Cranberry Sauce recipe promises to be a pretty and delicious addition to your Thanksgiving feast! Dovetailing Tip: If you made this recipe on day 1 for the Cranberry Jello Salad make sure to use it today! Add cranberries and apple juice to a large pot. When cranberries begin to burst, add maple syrup and sugar. Stir to combine. Return to a simmer, and continue cooking for about 20 minutes until sauce has thickened slightly.